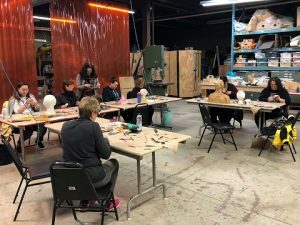 Off The Wall in Stratford, Ontario, was formed by theatre artists and arts education volunteers who wanted to mentor aspiring theatre production artists. Courses are held at the Desmond Heeley Theatre Production Arts Studio at Factory163. 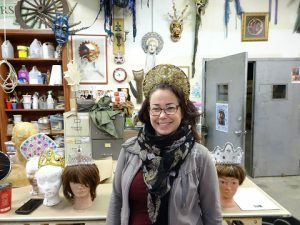 Coincidentally, the furniture and set for the first Stratford Festival production in 1953 was built in this very building that now encourages tenants, like Off The Wall, to create, connect, and evolve. The working studio space is off-the-wall arty, with high ceilings, heavy creaking doors, curtained work areas and dazzling art pieces. 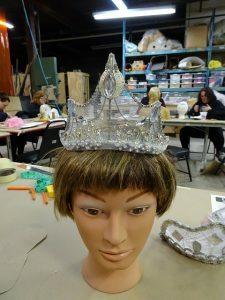 It is the perfect place to draw upon the imagination, to design and create masks, tiaras, wigs and faux food. 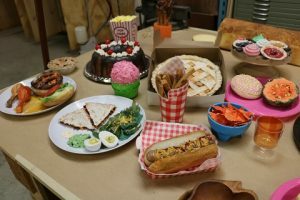 To build props and assemble a stage set. 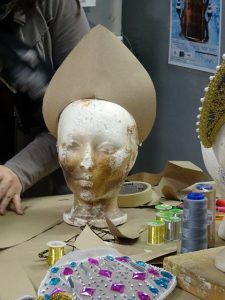 To become part of the backstage action of theatre production. To learn how theatre really works. 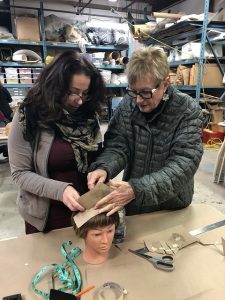 Each summer, by the time the Stratford Festival season is underway, the backstage artists have completed their assignments. Their creations are on stage, making magic with the audiences. 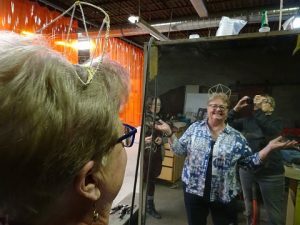 This means the artists are available to offer hands-on instruction at Off The Wall, sharing what they know and what they love. Students arrive from across Canada and around the world. 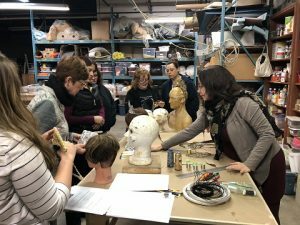 Off The Wall graduates often move on to university theatre design programs, serve apprenticeships at the Stratford Festival, and work backstage in both amateur and professional theatres in Canada and the United States. Some people take the courses and workshops for the sheer pleasure of being creative in a theatrical setting. A unique collaboration this summer involved a partnership with the Stratford Perth Museum. 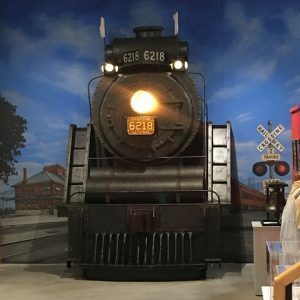 For inclusion in a permanent exhibit of the historical CNR/Grand Trunk Railway, Off The Wall students built a life-sized, front engine section of Train 6218. It was the last train to be repaired at the nearby Stratford engine facility. By dressing wood to look like steel and creating lights out of tomato cans, they utilized the backstage skill of re-configuring less costly and more practical items to make them look like rich and regal originals. 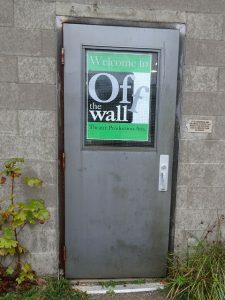 Off The Wall collaborates with local, independent theatre production companies by providing quality sets to smaller acting companies operating on smaller budgets. 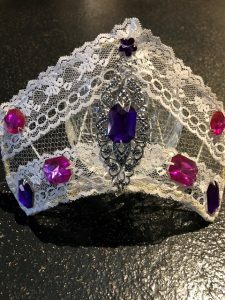 Eight of us took an Off The Wall tiara-making workshop with Tami MacDonald, an expert in jewelry and bijoux, the small delicately worked jewels, trinkets and little details that go into costume making. We had a choice. 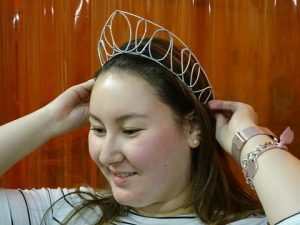 We could make either a tiara, which is smaller and Cinderella-like, or a diamante tiara, that is more regal and requires more detailed work. The Cooking Ladies chose the easier route. 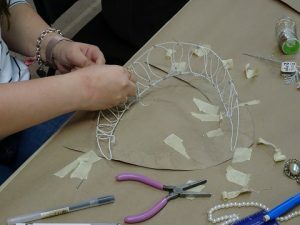 We drafted individual patterns on brown paper in order to have guides to follow when we began to work with wire for the tiaras’ frames. 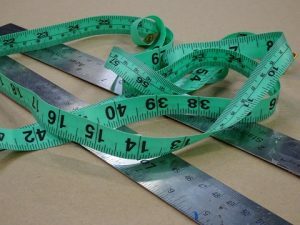 We measured, cut, and trimmed. When it came time to test the paper tiaras we pinned them on hairdressing heads. 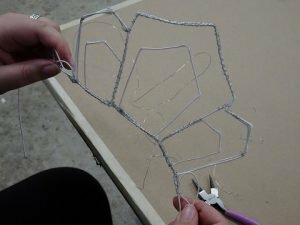 We bent, turned and cajoled our wire along the outlines of our patterns then basted and sewed the joints in place with thin thread-like wire. 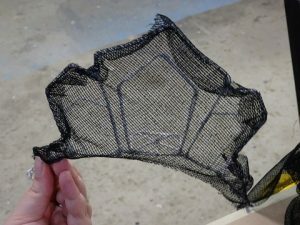 When all the wires were tidied, with sharp ends tucked away, we tested our tiara frames to be sure they would fit. 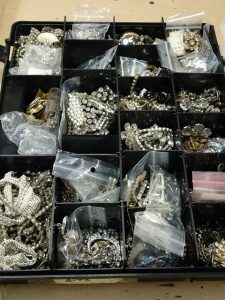 Tami opened up bins of lace, broken jewelry, and trinkets. 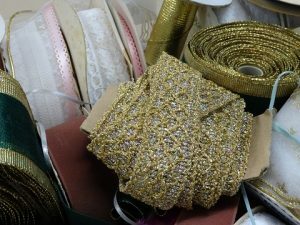 We rummaged through them to find just the right combination of textures and colours for our tiaras. 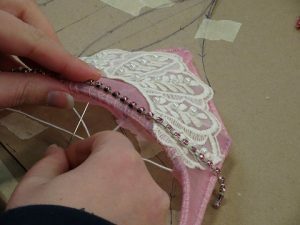 We sewed a crinoline-type material to our frames, as a backdrop for our jewelry. Some chose white, others pink or black. 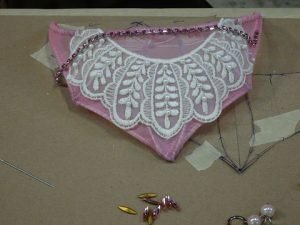 The Cooking Ladies combined white background mesh and white lace with silver centrepiece and contrasting pink and purple gems. 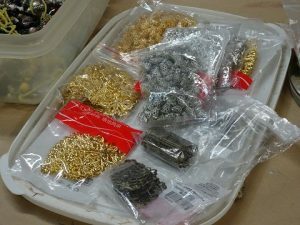 The exciting final touch was arranging our chosen gems and sewing them in place. It was a fun day. 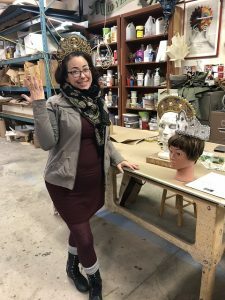 In the process of experiencing the art of tiara-making at Off The Wall, we discovered that massive amounts of time, patience, creativity, and skill are required to craft tiaras for the kings, queens, and princesses on the Stratford Festival and other live theatre stages. 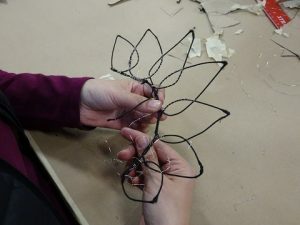 To learn more about upcoming Off The wall workshops and courses, go to https://www.stratfordoffthewall.com/. The Cooking Ladies would like to thank Stratford Tourism and Off The Wall for this experience. And Tami MacDonald for her patience. 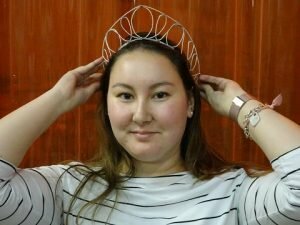 Great Blog Ladies! Thanks for singing the praises of Off the Wall.